The book, published by All Things that Matter Press, is a mystery novel — a genre Clark has always been interested in. Once Clark retired, he said he thought he’d give writing a novel a chance. The book begins with the murder of a well respected judge in the mid-1950s Midwest. The suspect is the judge’s daughter, Carrie. Police investigators circumvent their own investigators to have her committed to the Elm Hill Psychiatric Hospital for Women instead of being arrested, but Carol Mason, the hospital’s director of nursing, immediately spots several clues that indicate Carrie may be innocent. Mason works to solve the murder and uncover the hospital’s secrets with an informal team of associates who call themselves the “black angels,” because of the black raincoats they wear when Carrie is brought to the hospital. The book’s setting, a psychiatric hospital, is something Clark has found interesting in other books he’s read, such as “One Flew Over the Cuckoo’s Nest” by Ken Kesey and “Shutter Island” by Dennis Lehane. While writing, Clark did research into the background of psychiatric hospitals, reading books written in the ’40s and ’50s about the subject. Clark said he worked to highlight the complexity of being a nurse during the ’50s at a psychiatric hospital, saying in many cases there are negative and positive things happening with no immediate solution. He hopes readers will feel perplexed while reading the book and motivated to try and solve the mystery before the end, like someone reading any good mystery novel often tries to do. “It’s a puzzle, a mystery; I hope readers try to puzzle it out,” Clark said. For those who enjoy “The Black Angels,” Clark is already knee deep in a sequel, featuring the same main character, Mason. The book, titled “A Strait Jacket for Sarah,” will be set two months after “The Black Angels” and in the same psychiatric hospital. In his sequel, a new crisis arises when a nurse is caught sneaking out of a mysterious tunnel under the hospital. An investigation into her escape leads to the arrest of two other nurses and strongly suggests a new criminal plot to take over Elm Hill Psychiatric Hospital for Women. 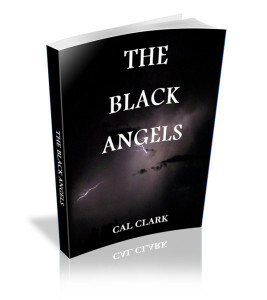 To read the first two chapters of “The Black Angels and its sequel, visit www.blackangelesmysteris.com. More information about Clark is available on the site as well as a link to buy “The Black Angels” on Amazon.